Let’s get one thing clear off the bat: this was a very good episode of Fringe. The problem, of course, is that this is the second half of a two-part finale, the first half of which was shockingly mediocre (if not outright bad). The larger question is what sum we arrive at when combining the two, and where does that leave the series with 13 hours remaining? Let’s start with the positives. The death and life of Olivia Dunham scene was excellent and was something only Fringe could have delivered. The promotion of General Broyles was a nice touch (especially with the Raiders of the Lost Ark undertones). 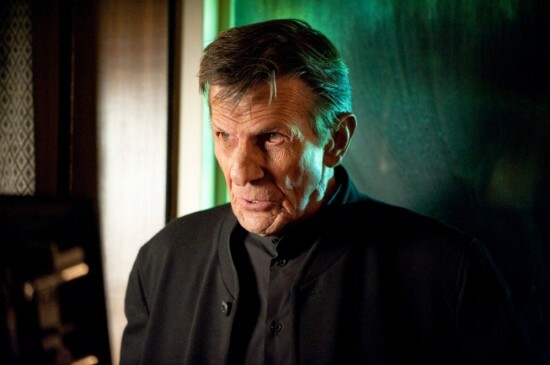 Leonard Nimoy is considerably less hammy this week, and he and John Noble have some great moments together that really bring the character of Walter full circle. Except that this isn’t Walter—at least not the Walter whose memories and experiences we’re familiar with, and there’s the problem. The season-long experiment with a new timeline has produced some wonderful moments, but frankly there was a lot of time wasted on throwaway storylines that could have been spent re-establishing some kind of connection to the characters that we spent so much time with. Having Olivia get her old memories back was great, but the other characters would have benefitted from something similar, particularly if this episode was the planned endgame. Without some kind of new connection, then this is not the William Bell I want to see defeated nor the Walter I truly care about. They are proxies, always a step removed from the story I was hoping for. They are echoes, and while admittedly an important part of the show’s mythos, they are disappointingly ineffective here. Take the repeated revelation that Bell cut out part of Walter’s brain at Walter’s request. This is information we already knew and an altered version of a scene we’ve seen before. While it does offer some illumination on what sort of men these two are in contrast to their predecessors, the end result is identical; Walter brought about his own lobotomy due to fear over what he was capable of. The root of that fear may have shifted along with the fine details, but the overarching issue is the same and frankly it’s no more interesting than it was the first time. This goes back to my long-running complaint that despite many, many fantastical elements, the creative team has never fully embraced the possibilities that their genre provides them. I fully recognize how bizarre that sounds in regard to a show that regularly uses time travel, alternate universes and superpowers as stock plot elements, but the simple fact is that time and again, the show has walked itself to the edge of legendary lunacy but has always backed down rather than taking the leap. The real problem for me was that even when the writers made new opportunities for themselves, they refused to take them. I really hoped that the information we gained in the 2036 episode would allow for some mind-bending cause and effect inversion where some sort of time travel or precognition would be required. Wouldn’t it have been much more interesting if Walter had only insisted on his lobotomy because he knew Henrietta and the future Fringe team would need the bit of removed brain to restore him to his old self? That would have been a revealing shift from what we had seen before and would have sent people like me scrambling to re-think other past events to determine whether there were other easter eggs to find. Plus we could have had some sort of weird yet humorous line from Walter about the chicken and the egg and how which came first depends on where the observer (pun intended) enters the timeline. This stuff writes itself. What we have instead feels like something of a missed opportunity. Too much time was spent on things we don’t care about (the so-obviously-a-mole Rebecca Mader for instance) and everything felt too rushed and completely by the numbers. In a strange way the entire series has felt like a build up to something truly epic, and instead this felt pedestrian and expected. The producers made a big deal out of saying that this finale could serve as both a series or season finale and that they had shot some additional material depending on how the cards fell. After the renewal, they were careful to say that this episode would air as they intended and that there was no ‘alternate’ ending for fans to wonder about. Having now seen it, I see what they meant. I assume that had the show not been picked up for one more half season, it would have ended without the last scene and September’s ominous warning. And to be fair, they’re correct. This could have served as a series finale, but that doesn’t mean it would have been the ending that the series deserves. Despite my misgivings about many parts of this season, I’m quite hopeful about the remaining 13 episodes. For once, there are no ratings to worry about, no studio notes to consider and, most importantly, no more reason to delay telling your story. The writers now know precisely how much time is left on the clock and I sincerely hope that they come up with a game plan worthy of the four seasons of promise they have developed. May I humbly suggest that the “they” September referred to should be the Observer overlords from the future and that the first 10 hours should be spent with General Broyles and his team reuniting with the other side somehow in order to resist and fight back. Then we can have a three-part finale that jumps back and forth from the future to the past (maybe even far enough back to plant a machine) with a truly epic resolution that ties everything up nicely. A guy can dream can’t he? Besides, even if I don’t get the final season I want, I’ll have a few good months to hope for it, and how many shows give you that? -The international cast normally does a very good job with their accents, but apparently yelling “Get the letter opener!“ in a menacing manner is more than John Noble’s American accent can withstand. No issue here, it just made me chuckle. -The show has referenced Star Trek before, but never so overtly as it did in the opening scenes of tonight’s episode. Bell’s lines to Walter (and the situation of showing off a man-made new world) were lifted almost verbatim from Carol Marcus’ conversation with Captain Kirk regarding the Planet Genesis in Star Trek II: The Wrath of Khan. The scene works on its own merits, but from a geek point of view, it was transcendent. Nothing makes us nerds happier than riffing on one of our beloved classics. Now if the writers had only paid attention to the rest of the movie and taken some notes on how to correctly use a truly legendary villain. Sigh. -If you want to see how some seriously twisted sci-fi can be done on a budget, seek out Primer from 2004. Writer/director/star Shane Carruth made it for less than $20,000 and it is a testament to how good writing and plotting can triumph over a small budget (which may be exactly what Fringe is facing next season). The movie comes in at a lean 77 minutes and veers wildly from accessible to virtually unintelligible and I mean that as a compliment. I occasionally mock people who can’t follow twisty movies and I often struggle to keep up with the last 20 minutes of Primer. Even when I can follow it while watching, I can’t quite put the pieces back together the next day. Watching Primer makes me wonder if that’s what dementia feels like. It’s that kind of aggressive sci-fi insanity that I continue to hope Fringe will eventually embrace and it has nothing to do with dollars. Here’s hoping.